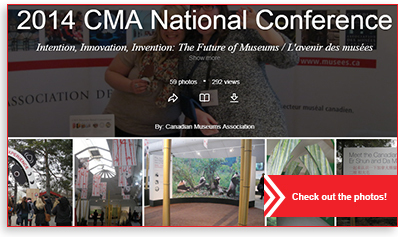 More than 450 museum professionals gathered in Toronto, Ont. 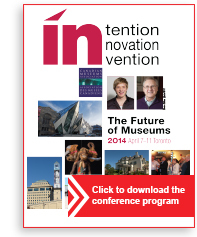 to share their thoughts and ideas on the challenges facing museums today and how to be successful in the future. The combination of over 50 different specialized workshops, study tours, educational sessions and inspiring keynote speakers provided a unique professional development opportunity for attendees. The conference also provided valuable networking opportunities during evening events at the Royal Ontario Museum, the TIFF Bell Lightbox and the popular Masquerade Closing Banquet. The CMA was proud to celebrate exceptional projects and museum professionals by presenting a total of 15 awards. The sold-out Deaccessioning Symposium addressed the following questions: “Must works donated or purchased by a museum or gallery be held as public trust forever or can they be sold or given away for a variety of justifications?” How should revenues be allocated? 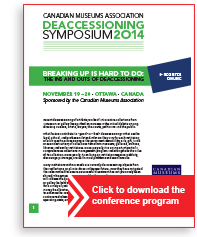 Following the success of the Symposium, a new guide is being developed.